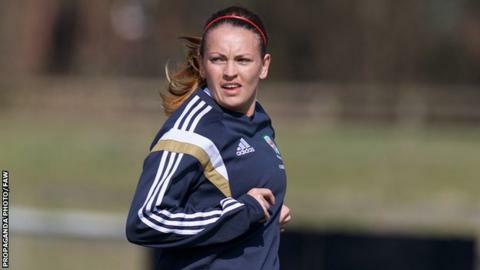 Chloe Chivers' late header rescued a draw for Wales women against Finland in their opening game of the Cyprus Cup in Lanarca. Adelina Engman put Finland ahead after 10 minutes before Kayleigh Green equalised for Jayne Ludlow's side. Maija Saari restored Finland's lead but Chivers headed home Nadia Lawrence's cross with three minutes remaining. Wales face Poland on Friday before Monday's final Group B game against the Czech Republic. The final round of matches will take place on Wednesday, 9 March. Ludlow's side are preparing for their Euro 2017 qualifier away to Kazakhstan on 12 April. Wales are third in their Euro 2017 group after four games, five points behind group leaders Austria, who have won all three of their matches to date. "I thought we were hard done by to get the draw but we'll take the positives and it's one step closer to where we want to be. "We want to compete with the bigger players and the bigger teams and we've proven we can do that over 90 minutes. "We've started well and we can look forward to Poland on Friday."